The Iranian Kandys cape and its legacy in Europe (click to enlarge). (A) Medo-Persian nobleman from Persepolis wearing the Iranian Kandys cape of the nobility 2500 years past (B) figure of Paul dressed in North Iranian/Germanic dress from a 5th century ivory plaque depicting the life of Saint-Paul (C) reconstruction by Daniel Peterson (The Roman Legions, published by Windrow & Greene in 1992, pp.84) of a 4th-5th century Germanic warrior wearing Iranian style dress and the Kandys. The Iranian Persepolis styles of arts and architecture continued to exert a profound influence far beyond its borders for centuries after its destruction by Alexander. Maaestro Loris Tjeknavorian is one of the world’s leading composers. For more information on the Maestro’s works consult his website here. In 1963 Carl Orff granted him a scholarship, which allowed him to reside in Salzburg and to continue working on his opera “Rostam and Sohrab“, one of the major epics of Firdowsi’s Shahname, known as the “Iliad of Persia“. 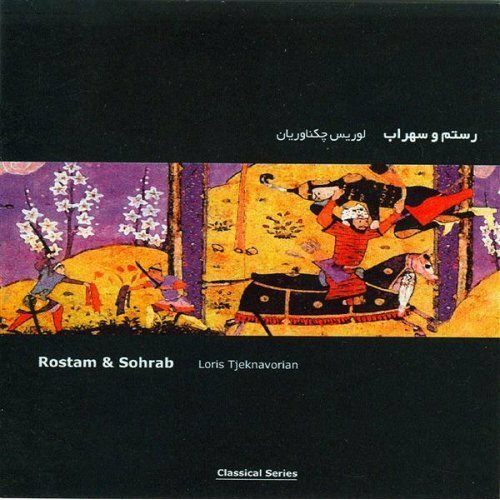 Maestro Loris Tjeknavorian’s masterpiece Opera “Rostam and Sohrab” from the Shahname epic. Note that the Shahname epics have parallels in the Legend of King Arthur. In 1965 Tjeknavorian began to study conducting at the University of Michigan. From 1966 to 1967 he was appointed composer in residence at the Concordia College in Moorhead, Minnesota, and from 1966 to 1970 head of the instrumental and opera departments at the Moorhead University in Minnesota. In 1975 Tjeknavorian signed an exclusive conducting contract with the RCA recording company and made many successful recordings with leading orchestras, such as the London Symphony Orchestra, the Royal Philharmonic Orchestra, the London Philharmonic Orchestra, etc. Maestro Loris Tjeknavorian conducts his “Rostam and Sohrab” Opera in Tehran. The Opera video above (which features English subtitles) is towards the end of the performance which outlines the final tragedy of Sohrab’s funeral. In 1989, Tjeknavorian was appointed Principal Conductor and Artistic Director of the Armenian Philharmonic Orchestra. During his eleven years of collaboration with the orchestra, his recordings for ORF (the Austrian radio and television station) and ASV (an English recording company) achieved world-wide recognition. In 2010 Tjeknavorian was appointed Principal Conductor and Artistic Director of the Glendale Symphony Orchestra in California. Iranian opera singer Darya Dadvar sings the tragedy of Rostam and Sohrab in Tehran. She currently resides in France. In the course of his career, Tjeknavorian has made numerous recordings (with RCA, Philips, EMI, ASV, etc.) and written more than 70 compositions (symphonies, operas, a requiem, chamber music, concerto for piano, violin, guitar, cello and pipa (Chinese lute), ballet music, choral works and an oratorio, and over 40 film scores. His works have been performed by some of the world’s major orchestras (including the Vienna Symphony, the London Philharmonic, the American Symphony, etc.) and have received high critical acclaim. Among his many honors, Tjeknavorian was recently presented with the Austrian Presidential Gold Medal for Artistic Merit. Professor Hamid Ahmadi (Associate Professor of Political Science, Faculty of Law and political Science, University of Tehran)(حمید احمدی – استاد و عضو هیات علمی دانشکده حقوق و علوم سیاسی دانشگاه تهران–) is perhaps one of the foremost experts today on ethno-nationalism in Iran, Turkey, the Persian Gulf region and Central Asia. -حمید احمدی – استاد و عضو هیات علمی دانشکده حقوق و علوم سیاسی دانشگاه تهران- Professor Hamid Ahmadi is one of the foremost experts on the relationships between domestic and international factors and their interplay with ethnic politics in Iran, Central Asia, the Caucasus and the Persian Gulf regions. -حویذ احوذی–Hamid Ahmadi: Turkey, pan-Turkism and Central Asia, Central Eurasia Studies, Volume 2 (issue 2), 2010-مطالعات اوراسیای مرکزی، مرکز مطالعات عالی بین المللی، دانشکده حقوق و علوم سیاسی (ویژه همایش -مطالعات منطقه ای)، سال دوم، شماره 5، زمستان 1388، صفحات 1-22- (pdf). هدف اين پژوهش، بررسي تأثيرات ايدئولوژي پان تركيسم در آسياي مركزي است. فروپاشي اتحاد جماهير شوروي و استقلال كشورهاي آسياي مركزي و قفقاز، بار ديگر اميد نظريه پردازان و استراتژيست‌هاي پان‏تركيسم را كه پس از جنگ دوم در رابطه با پيشبرد پروژه برپايي يك امپراطوري ترك زبان در مناطق جنوبي شوروي دچار سرخوردگي و نا اميدي شده بودند، زنده كرد. This research seeks to study the impact of Pan-Turkist ideology on Central Asia. The collapse of the Soviet Union and independence of the Central Asian and Caucasian states once again revitalized hopes among the Pan-Turkist theoreticians and strategists who were hopeless about the implementation of their project of establishing a Turkic empire in the southern parts of the Soviet Union. Considering the Pan-Turkist ideals in Turkey’s foreign policy and the 15-year long efforts by the country’s politicians and intellectuals in promoting the Pan-Turkist project of alliance among Central Asian republics, this article addresses these efforts and their effects on Central Asia and finally regional countries’ reaction to the Pan-Turkist ideals. The main hypothesis of the research includes that unlike original ideas, Pan-Turkism has not progressed so much in its political aspects, which made Turkish politicians hesitant about it. Ethnic Identity and Ethnic inclinations in Iran: Myths and Realities . Published in Tehran by Nashr e Ney publishers in 2010. The Foundations of Iranian National Identity. Published in Tehran by Iscs publishers in 2009.